"If you want to succeed, get some enemies." (Edison, as quoted in the Ladies Home Journal, April 1898). Successful inventions spawn competition which, in turn, often stimulates new inventions. Edison's lighting system was no exception and competitors very quickly introduced similar products. Some copied what he had done; others used their own inventive talent to create new ideas and new devices. The competition provoked controversy and a great deal of activity. By 1891 there were over 1,300 incandescent lighting central stations in the United States with a capacity of approximately three million lamps. Towns and cities across the country competed with each other for the privilege of being the first in their area to gain access to the new technology. Developed in England in the 1790s, gas light technology spread quickly. In 1816 gas streetlights went into service in Baltimore, and by the time of Edison's 1879 lamp invention, gas lighting was a mature, well-established industry. The gas infrastructure was in place, franchises had been granted, and manufacturing facilities for both gas and equipment were in profitable operation. Perhaps as important, people had grown accustomed to the idea of lighting with gas. Edison consciously modeled his plans for an electric lighting system on the gas light technology. Instead of gas-making plants, he designed generators. Where pipes ran under the streets distributing gas to end users, he planned to place electrical "mains" (conductors) to carry current. Since people were able to have gas lamps in many rooms and control them individually, Edison intended his lamps to be capable of independent operation. Even before Edison demonstrated a working lamp, gas stocks began to fall in price. 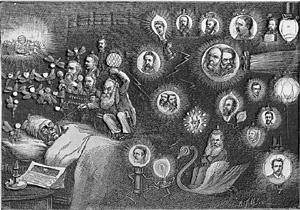 In late 1879 he and his men began making detailed cost studies of gas light in order to determine price goals that the electric light would have to meet. After the lamp invention, promotions for the Edison system duly reported deaths and injuries due to gas. Despite nightmares like the one depicted above, gas manufacturers responded to the challenge with two major advances. The first was better quality gas. The second was an incandescent mantle invented by Carl Auer von Welsbach of Austria (who later invented the first commercial metal filament light bulb). Both innovations resulted in more brighter, more efficient light. Gas proved a tough competitor since infrastructure already existed, whereas electric light could not be used until generating plants were built and wires were strung. Also, gas could be used for heating and cooking as well as light. In 1910, GE's William Coolidge invented a tungsten-filament lamp capable of giving 10 lumens per watt. That invention, combined with the growing level of electrification in the country effectively eliminated competition from gas lighting. 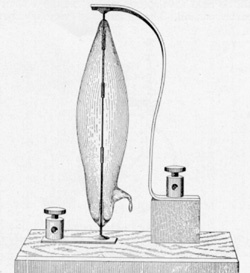 Swan demonstrated a working lamp of the design seen to the left in several early 1879 lectures. But his lamp (like those of the other contenders) used a carbon rod of relatively low electrical resistance. It was practical only if used in series (where the current flowed successively through several lamps that would turn and off together) or if it was close to the power supply (so that the lead wires would be short). Swan had experimented with carbonized paper filaments for some years, however. Once he learned that a high resistance filament was needed, he quickly adapted it to his own lamps and established the Swan Electric Light Company. It should be noted that Swan had been granted several patents for various lamp features before Edison's breakthrough. Indeed Swan's patent position in England was strong enough that in mid-1882 a merger was arranged and the Edison & Swan United Company ("Ediswan") was formed. Hiram Maxim also quickly produced a lamp containing a high-resistance filament in 1880. One of the reasons Maxim was able to introduce a product so fast was that he had hired Ludwig Boehm (Edison's glassblower) away from Menlo Park earlier that year. Maxim soon moved on to other inventions (such as machine guns), but the United States Electric Lighting Company installed systems that used the Maxim lamp for several years. The company was purchased by George Westinghouse in 1888. The company Elihu Thomson and Edwin Houston established in 1880 to sell arc lamp systems became quite successful and diversified into other electrical markets. In 1886 they purchased the Sawyer & Man Electric Co. and began making incandescent lamps under the Sawyer-Man patents. By 1890, Edison, Thomson-Houston, and Westinghouse were the "Big 3" of the American lighting industry. In 1892, J. Pierpont Morgan engineered a merger between the Edison interests and Thomson-Houston. The resulting company was named General Electric. George Westinghouse's initial fame stemmed from his invention of an air-brake that vastly improved railroad safety. In the 1880s he too diversified into electrical equipment and then into electric lamps. At the time he bought U.S. Electric Lighting Co. and began making lamps, the company was being sued by Edison for patent infringement. In 1892 the courts decided in Edison's favor and forced Westinghouse to stop production. However, Westinghouse had obtained rights to the Sawyer-Man patents and quickly retooled to make non-infringing lamps based on those patents. He produced these "Stopper lamps" until Edison's patents expired in 1897. Critical to any electrical system is the ability to measure at any moment the flow of electricity (the current) and the force on it (voltage). These techniques were well known, and it was a relatively simple matter to design instruments that could deal with the relatively high flow in lighting circuits (like the Elihu Thomson voltmeter shown here). For a commercial enterprise, it was also important to know how much energy the customer was using. Edison designed a chemical meter in which a portion of the current being supplied caused metal to be deposited on an electrode. The electrode could then be weighed to give a measure of the energy consumed. 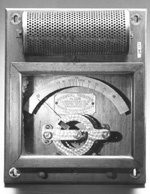 Later electromagnetic meters registered watt-hours directly by measuring the product of voltage and current over time. Both alternating and direct current had been used for arc lights, and both could be used for incandescent lamps. However, in the early 1880s motors could function effectively only on DC. There was an expectation that electricity could be stored in batteries during off-peak hours, and this was possible only with DC. Finally, there was evidence that at the same voltages AC was more dangerous than DC. All of this led Edison to prefer a DC system. An important advantage for AC became apparent with the invention of the transformer in 1883. This meant that the voltage from an AC generator could be efficiently increased for transmission and then decreased at the other end for use in the home or factory. (Electrical energy is proportional to voltage times current, so that boosting the voltage means that the same amount of energy can be transmitted with less current flow. Since heat produced in the line is a function of the current and the resistance, so with less current the loses are less.) For short lines (of a mile or so) this made little difference. But for long distances it would be critical. 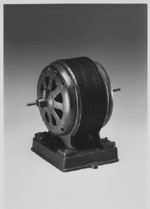 The Westinghouse and Thomson-Houston companies preferred AC, and their faith was justified when Nikola Tesla invented a practical AC motor in 1888 (an early example is shown in the picture). Additional Tesla polyphase patents made AC systems more efficient. These patents were used by Westinghouse at Niagara Falls in 1895. During the 1880s a sometimes fierceand not always logicalbattle was waged between proponents of AC and of DC. Edison himself became less involved as he devoted more time to his new laboratory at West Orange, New Jersey, after 1886, and as he became more involved with his iron-ore project. The Edison and Thomson-Houston companies merged in 1892 to form General Electric.